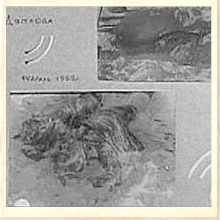 The mystery of Dyatlov’s Pass is to understand what really happened that night. The Russian authorities’ may-or-may not know themselves. The available evidence may-or-may not be wholly accurate and our review of various versions of events – some in Russian – has already suggested some timeline and factual anomalies. Given this, the theories presented below have been based on what people believe they know. We don’t often become sentimental about the things that we write about but this case is different. These people experienced something horrific and then died and no one really knows why. This is one mystery that deserves to be solved. As the X-files used to say – The truth is out there – so would someone please own up! You’re too old now to get into any real trouble. “As there was no evidence of a guilty party the reasons for the actions of the ski-team and their subsequent injuries is unknown. All that can be said is that they were the victims of a “Compelling Force”. Even until today the authorities have failed to clarify what they meant by this statement. Were they referring to a physical force capable of inflicting the injuries, such as a shockwave, or were they referring to a mental compulsion – or perhaps both? The escape route taken by the fleeing ski team. 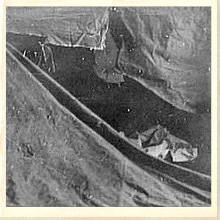 The landscape picture was taken by the 2004 expedition while the semi-transparent black and white image was from the original investigation in 1959 and has been used to show the location of the tent. When the ski-team set up their last camp the slopes of Kholat-Syakhl (a Mansi name, meaning Mountain of the Dead) they chose a spot that has surprised both rescuers and investigators. It was highly exposed and possibly in the path of a small avalanche should it occur. However, it was a good place from which to start the following day’s journey. As experienced skiers and hikers it is likely that the team was concerned about where they were camping. Maybe they saw the risk as low and worth taking or were just too tired to relocate. The theory suggests that regardless of their misgivings they stayed where they were. However, as night fell and the wind rose these misgivings may have turned to nervousness and finally fear. Perhaps there were arguments and disagreements about what they should do. Then, to increase their anxiety, they could periodically here faint roaring and rumbling noises above the wind. Was this the sound of rocks and snow sliding down far mountains? Still, they had no choice but to stay where they were and prepared to sleep. For a while the group remains together but as their situation deteriorates they urgently discuss what to do. The wind is literally killing them. Slobodin climbs a tree to see if he can make out the camp. On the way down he slips and receives a minor skull-fracture. In desperation, Dyatlov decides to head back for the camp and see if he can access their supplies. He and two others (Zinaida Kolmogorova & Rustem Slobodin) set off but never make it. They die one-by-one of hypothermia. Under the pine tree the others wait, perhaps they shout out to Dyatlov but hear nothing. 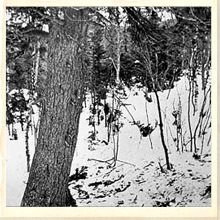 They remain under the pine and while they do so both Georgyi Krivonischenko & Yuri Doroshenko die from hypothermia. Dubinina hates herself for what she does but she still removes Krivonischenko’s trousers to wrap around her freezing feet. This action suggests that at this time she was not as yet severely injured. When Igor Dyatlov fails to return they assume that the camp site is gone and that Dyatlov is dead. They make the decision to move into the forest – possibly in search of a pine cave to shelter in. They abandon their dead comrades and march 75m metres into and along the forest. Fate is against them and suddenly the ground gives way and they fall into a ravine. Three of them sustain serious impact injuries. Dubinina and Nicolas Thibeaux-Brignollel die almost instantly. Alexander Kolevatov takes Dubinina’s hat and coat and tries to keep Alexander Zolotarev warm but cold and exhaustion quickly claims the lives of the remaining two survivors. The rescuers found the campsite on 26 February 1959 and quickly discovered the first five bodies. It took a further three months to find the remaining four in the snow filled ravine. Apparently radiation was identified on the cloths of some of the victims but this may well have been from work they did at the polytechnic and thus nothing to do with the strange deaths. The lack of bruising and hard-impact contusions on the bodies may or may not be true. However, bruises and the like form far more slowly in colder temperatures and in the case of people frozen to death may not form at all. Finally, after two months in the frozen snow there would be considerable tissue damage that could disguise existing bruises. 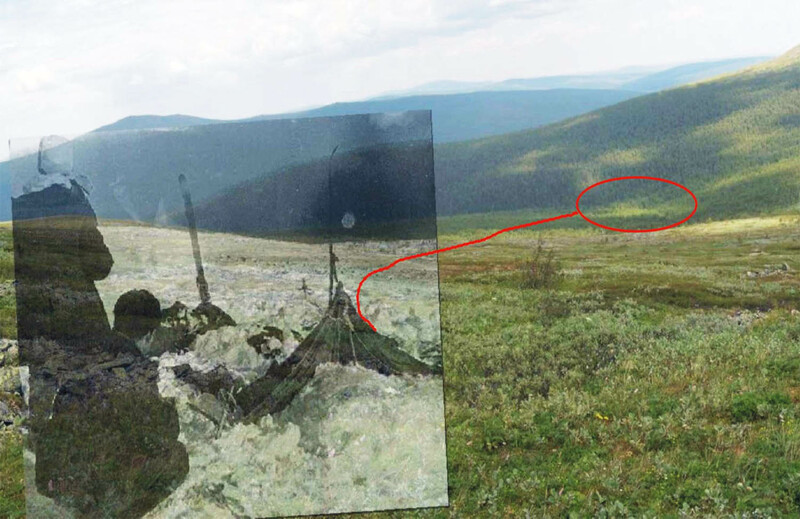 The locations where the hikers of The Dyatlov Pass Incident are believed to have died. Perhaps the most mysterious part of the incident was the discovery that Dubinina’s tongue had been ripped from her mouth. In this theory, the explanation is that her mouth may have been open and her tongue available to a scavenger, such as a fox, that would take what it could and leave. The reason for the Russian secrecy can also be explained if they were actually testing new jet fighters in the area and were thus paranoid about high levels of security. Also, they in no way wanted to be associated with the deaths of nine good citizens. For the strange orange tan and so called grey hair displayed by the victims this theory has no answer other than to say that it could be exaggeration, normal sunburn or even morticians at work. Comment: This theory is a practical approach based on the evidence available. It takes all the key elements of the mystery and provides a cause-and-effect chain where the components do fit together in a plausible way. It’s not without problems though. Would the skiers really be fooled by a jet flying overhead? Once they reached the trees would they not have realised that there had been no avalanche and immediately return to their tents? How could three people sustain such crippling injuries by falling into a shallow ravine? Also … a study of the photographs indicates that there was actually only a very, very small chance of an avalanche. The discovery of the ski team’s tent by the rescue party. The notorious pine tree were the group first stopped and built a fire. The ripped / cut tent. Did they really have to leave it so fast? This was the first theory to emerge but was quickly discredited by the Russian authorities. In this theory the skiers, who are inside their tents, are surprised by Mansi native intruders. The intruders cut open the sides of the tent and force the partially clothed skiers down the hill to the forest. It is the intruders that build a fire for skiers and force them to wait in the freezing cold. After a while two of the skiers die from hypothermia. Dyatlov and two companions make a run for the tents (perhaps to get the rifle?) but exhausted before they even start, they collapse on the way and die. The remaining survivors are forced to march into the woods and made to stand at the edge of a convenient ravine but not before they take what clothes they can from their fallen comrades. Nicolas Thibeaux-Brignollel is struck over the head with a weapon crushing his skull. Dubinina keeps shouting at the attackers to stop so they force her to the ground and kneel on her chest thus breaking her ribs they then rip out her tongue. Half dead, they throw her into the ravine. They attempt the same on Alexander Zolotarev but only succeed in breaking his ribs. Alexander Kolevatov doesn’t wait but jumps after them and tries to save his injured companions. The attackers leave them all for dead. This was a theory apparently suggested at the time and dismissed. The reason for this was that according to the investigators there was no evidence of any other people in the vicinity. This is a dubious assessment as the whole area would have been walked over and examined by the rescuers before the investigation began. In addition, almost 23 days had passed before the discovery of the first set of victims. Snow and wind could have concealed many things during this time. One proponent of the abduction theory suggests that the Russian authorities knew that the Mansi had been involved but covered this up so as to avoid yet another tribal and ethic issue. In short, they wanted to avoid internal unrest and possibly low-grade military fighting. There is a very good reason for doing this – oil. A little known fact about this case is that in 1957 and 1958 the Soviet Union was desperately seeking increased oil production and had secretly decided to exploit the rich reserves in the Khantia-Mansia region. In 1960, the year after the event, one of the biggest oil exploitation projects began in this district. It is easy now to see what motivation the Russian authorities would have to avoid internal conflict. In addition, now that the USSR has broken up it is clear that many of the components of the Soviet Union were not that friendly – Ukraine, Georgia, etc. This theory discounts the orange lights, strange tans, grey hair and radiation as actually unrelated to the main event. 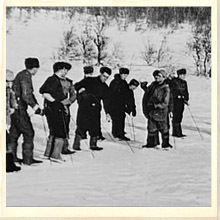 This theory proposes that on the night of the 2 February 1959 certain military tests were conducted very close to the where the ski-team had camped. The authorities conducting the tests were probably unaware that the ski-team was even in the vicinity. The weapon, if it exists at all, was probably an air burst concussion device with a possibly chemical warfare component. Whatever happened, it panicked the skiers who fled for the safety of the forest. They stayed under the pine tree until Dyatlov and his two companions decided to venture back to the camp where they die and freeze on route. Under the pine tree two further members die. The survivors try to wait it out but a second device is detonated overhead severely injuring three of them. Once again they are panicked into moving. After stumbling through the woods they reached the ravine. They clearly tried to survive but in the end all four died and were covered with snow. Dubanina’s tongue is later taken by a scavenger. Comment: This theory covers everything raised as a question by the evidence – just not very convincingly. Why test a weapon in this place when they had far better sites that they could use? Why did this weapon inflict such serious damage to some of the group but not others? Surely a blast sufficiently strong to crush a skull and break multiple ribs would have damaged the tents and or parts of the trees? Surely toxicology tests would have shown up evidence of chemicals sufficiently strong to change the victims’ skin colour? This list could go on and on. 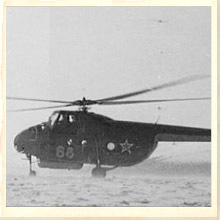 Russian search and rescue team using snow prods (1959). Helicopters are brought in to search for the lost ski team. 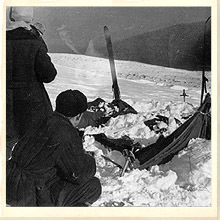 Finally, the bodies of Dyatlov Pass Incident are discovered. 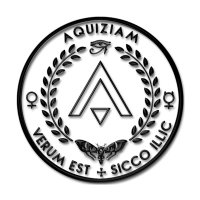 This theory claims that the ski-team probably melted contaminated snow for drinking water and subsequently experienced disorientation and hallucinations that caused them to behave as they did. Comment: For individuals that were supposedly hallucinating and disorientated they actually behaved in quite a rational manner. They managed to start a fire from wet wood, used clothes from their dead companions, tried to return to the camp for supplies and tried to take care of each other to the very end. No … this theory is just rubbish! The advantage of alien UFO theories is that you can invent anything to fit the facts. The main thrust of this theory about the Dyatlov Pass Incident is based on the strange lights, tanned orange skin and (supposedly) high levels of radiation (not true). In fact, the radiation was only a trace and superficial. In brief, this theory states that they were attacked by aliens who chased them into the forest, followed them and then tortured a few of them before tossing them into a ravine. Naturally this was done in the name of alien science. Still, if we play Devil’s advocate who really knows what aliens might want to do to humans?